Description: Cheers! 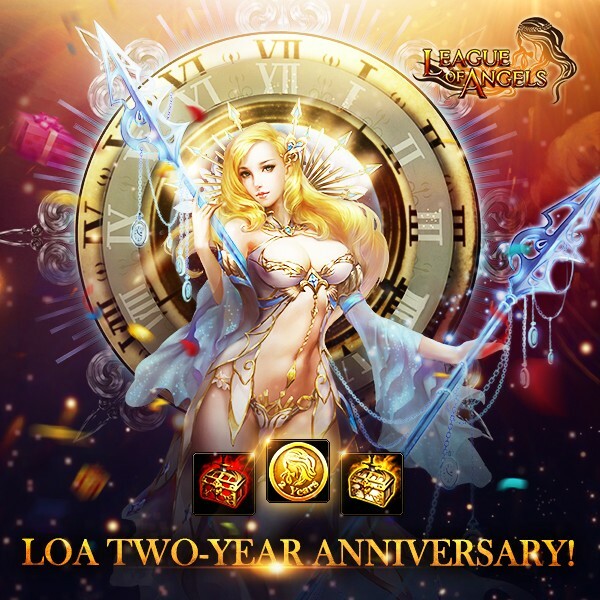 League of Angels is about two years old! To celebrate our 2 year anniversary, we prepare lots of events for you in Hot event from Dec 11 to Dec 13. You can get our 2nd Anniversary Coin( for exchanging awesome rewards), 2nd Anniversary Chests in these events. Do not miss them! Check it in Hot event and celebrate it with LoA together! Description: Login every day to get the rewards! Description: Exchange your 2nd Anniversary Coin to these rewards! Description: Do you still hold LOA 1Year Badge? Use them this time! Description: Login everyday to get more devotions to get them! Description: Complete all the tasks for more chests! Description: If you have activated these angels, then make these chests yours! Description: If you got these Heroes, then collect your rewards here! Description: Just owning these mounts, you can get these rewards. Do not miss it! Description: Consumed these resources to get more 2nd Anniversary Chests! Description: The more you spend, the more rewards you will get! More exciting events are coming up through Dec 11 to Dec 13 (Server Time), check them out in the in-game Hot Events menu now!